Welcome back, stamping friend! As promised, I’m back sharing Easter projects with you, from my class last Friday. In yesterday’s post, I shared the first Easter card we made, and 1 of the cute little Mini Egg Cartons that we decorated. If you missed that post, you can SEE IT HERE. 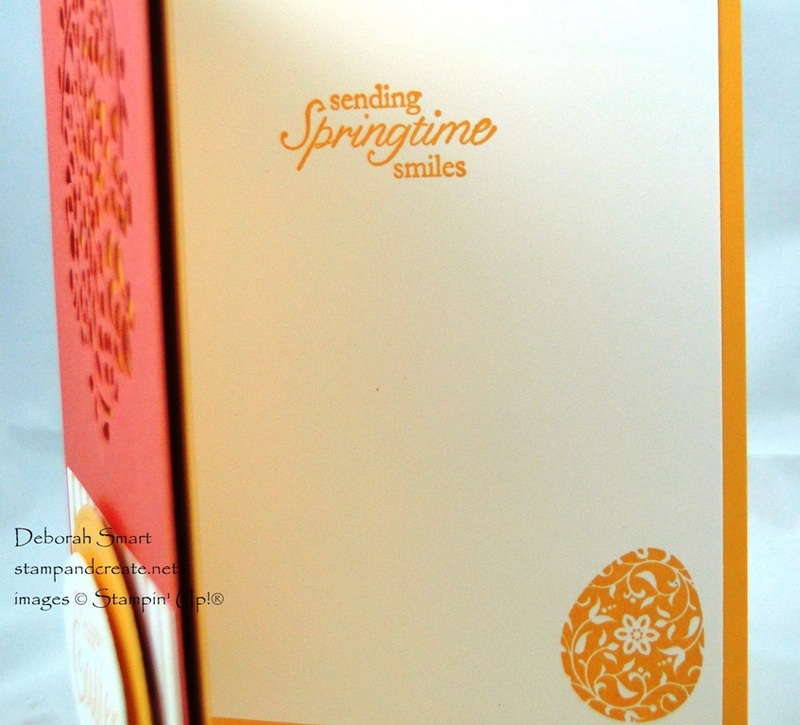 This Easter card uses bright, springy colours in Flirty Flamingo and Peekaboo Peach! The stamp set is long-retired, called Easter Blessings. First I cut a 4″ x 5 1/4″ panel of Flirty Flamingo cardstock. Then using the Window Box Thinlits Dies, I die cut the largest die in the top middle of the panel, using the Big Shot. The Precision Plate makes the little detailed pieces come out very easily! 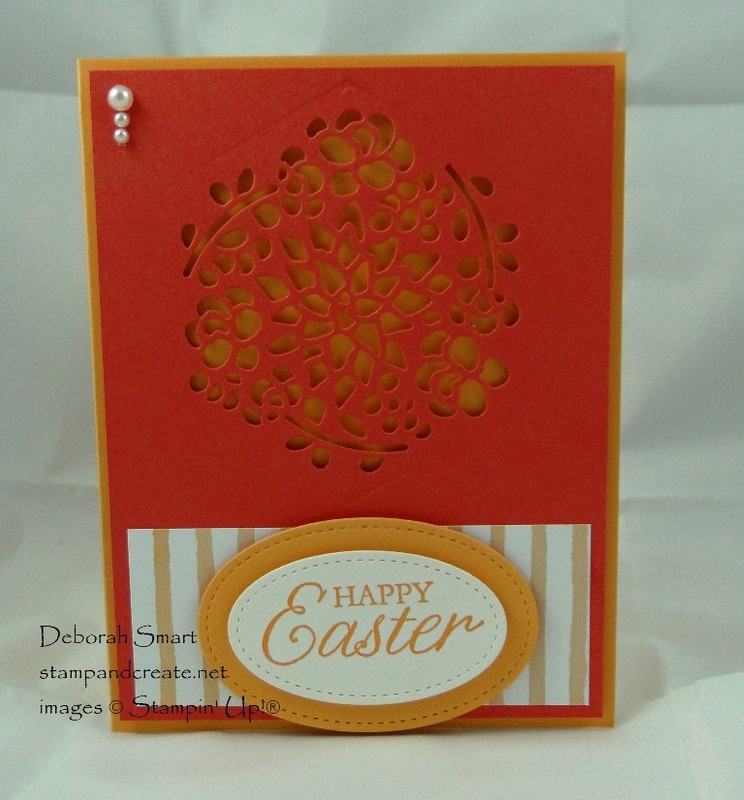 I attached this panel to the Peekaboo Peach card base using Stampin’ Dimensionals. The patterned paper is from the Fruit Stand Designer Series Paper collection; it’s a lovely soft watercolour looking peach stripe. I used Peekaboo Peach and Whisper White cardstock for the ovals, which are die cut using the Big Shot and the Stitched Shapes Framelits. 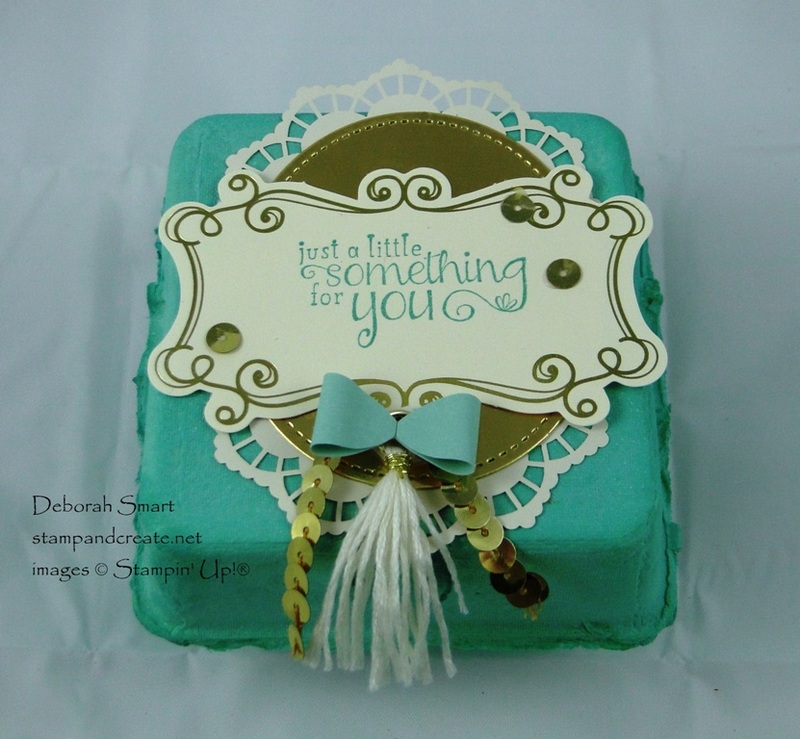 Everything was layered with either Multipurpose Glue or Stampin’ Dimensionals, and the addition of the Pearl Basic Jewels finishes off the card nicely! Of course, your card isn’t finished until you’ve stamped the inside! I used the retired stamp set Easter Blossoms for the sentiment and the easter egg in the bottom corner. 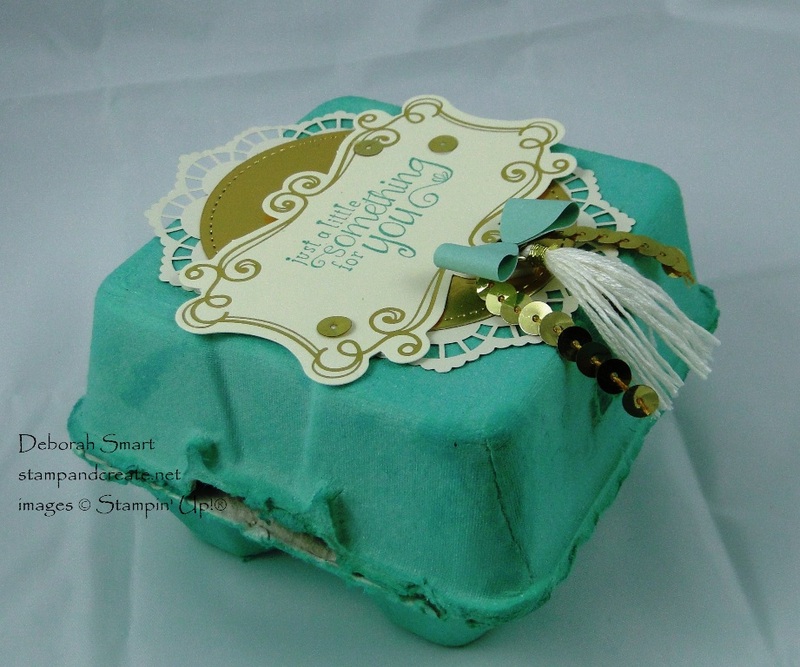 This Mini Egg Carton makes a cute gift or treat holder! For this carton, I decided to colour it, which is quite easy to do. I filled one of the Stampin’ Spritzers with half water and half rubbing alcohol. Then, I added 12 drops from the Bermuda Bay Ink Refill. This gave it a nice, rich colour. If you add less ink refill, you’ll get a lighter blue colour, so you can adjust the colour to your liking. Decorating this Mini Egg Carton was easy, once I decided to use the Cupcakes & Carousels Embellishment Kit. I added a Gold Foil Paper Circle, die cut using the Stitched Shapes Framelits, and a Lace Doily. To make these 2 layers more visible, I cut them in half, and glued them to the bottom of the label, after stamping the sentiment from the retired Num Num set in Bermuda Bay ink. Adding a length of Gold Sequin Trim with a Stampin’ Dimensional, then layering the cute little tassel and bow on top of that makes for a cute accessory. Finally, I added a few scattered sequins on the label. I hope that you’ve enjoyed me sharing my Easter projects. Hopefully you’ve been inspired to get your Easter projects ready, too! You can order the supplies for these projects by clicking on the images below. Previous Previous post: Hop To It and Get Ready for Easter! Beautiful projects. That egg carton is stunning, with the tassel and gold sparkles!